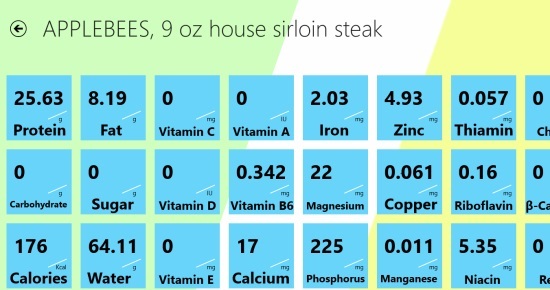 Nutrition Manager is a free Windows 8 Nutrition Manager app. You can use this app to find the Nutritional Facts about various food items. The data available through the app is provided by the the United States Department of Agriculture. So, there is no need of a second opinion, when it comes to the reliability of data the app is providing. Nutrition Manager also allows you to maintain a diary of your daily food consumption. The app can turn out to be a valuable resource for you, if you are a fitness fanatic. 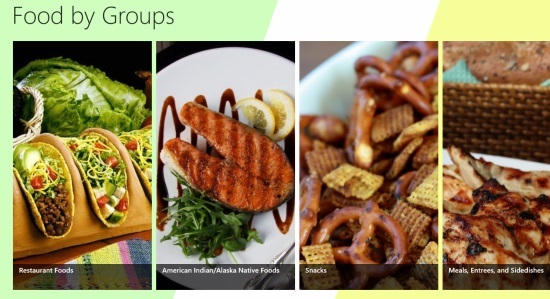 Nutrition Manager is freely available in the Health & Fitness category of the Windows Store. It can also be searched using Win + Q key combination or viewed directly using the link given at the end. The app will let you keep a watch on your Food consumption by providing you an overview of the amount of Calories, Fats, Proteins, and other things you are consuming. As you get to the main page which opens when you land into the app, the main food items that are consumed by people would appear categorized according to different things like places of their origin, ingredients, and more. Some of the main categories are Fast Food, Restaurant Food, Snacks, American Indian/Alaska Native Foods, Baked, Beef Products, Nut and Seed Products, etc. Get to any particular category that is present here, and you would see a list products available in that category. You can straight away use your mouse scroll button to browse through all the available food items, or can use the search box to search for them by names. If you get to any of the food item that is available here, you would be able to get all the necessary details about the food item. Details like the nutrients, minerals, fats, and other essential things are available here. As you get to the detail of any item, right click any where to open the bottom flyout. There, an add box is given where you have to specify the amount of the product in grams. You just have to enter the amount (no need to mention the unit). Click on the plus button that is available here. The food item will be added to your diary, with your current date. The only problem with the app is that you can’t maintain diary for any other date . But, for that, here is a trick for you to follow. Just change your system’s date from your system’s current date and time settings, and you can save the entry for any other date also. Use this trick, and I can ensure you that the app will work nice for you. If you click on the Diary icon that appears in the top flyout, all the diary entries would be shown. Click on any date to see the details for it. For any of the items, the Weight, Carbs, Proteins, Fat, and Energy would be given. Using that, you can keep track of the nutritional count of the items you consume. Use the bottom flyout if you want to edit any entry. Also check EatSmart and Active Fitness. 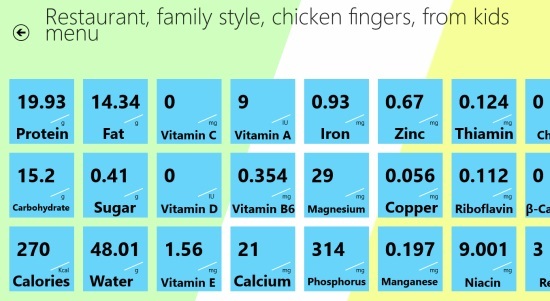 You can see the nutritional facts of the various food items you consume. There is an option to maintain a diary. The Database of the app is quite large. Pick data from United States Department of Agriculture. To conclude, I would like to say that Nutrition Manager is quite a nice Windows 8 Nutrition Manager App. Give it a try for sure.